It's a shame that we're always told that we have freedom of speech, yet a man with no criminal record was barred from Canada simply because he opposes war and the political ideologies of Canada. As the article says, there are many who see it as an obvious point that the Harper government used the issue of "security" to ban Mr. Galloway from appearing at a conference. A controversial British MP barred from entering Canada for a speaking tour earlier this year said Friday he has informed federal Immigration Minister Jason Kenney and the heads of two Canadian Jewish groups that he intends to file a libel suit against them. In a release Friday, George Galloway said he has given formal notice of the libel action to Kenney, Kenney's spokesman Alykhan Velshi, the Canadian Jewish Congress, CJC's chief executive Bernie Farber, CJC co-president Sylvain Abitbol and B'nai Brith Canada CEO Frank Dimant. "I welcome robust criticism, but the comments made about me crossed the line," Galloway, an outspoken supporter of the Palestinian cause, said in a statement Friday released by his Canadian lawyer. "They are not only untrue, they are outrageous. As an elected member of the British Parliament, I am compelled to exercise my legal right to clear my name." In an email to CBCNews.ca, Velshi said neither Galloway nor any lawyers acting on his behalf have made any attempt to contact him to inform him of their intention to launch a libel action. "My contact information is in the public domain," Velshi wrote. CJC spokesman Jordan Kerbel confirmed the group's national office in Ottawa was served with a notice of libel action at about 10:45 a.m. on Friday. When reached by CBCNews.ca earlier in the morning, the CJC's Farber said neither he nor his organization had received any kind of notice from Galloway or anyone claiming to represent the MP before the statement was released. Farber also said he was surprised to hear of Galloway's libel claim. "All I can tell you is there is nothing I can think of that we would have said that would warrant any libel action," Farber said. "The only thing he has done is use the media to get his message across." Anita Bromberg, B'nai Brith Canada's national director of legal affairs, said the organization received a lengthy notice of intention by fax on Friday. Bromberg told CBCNews.ca the notice names Dimant only, and cites a statement he made that was quoted in an article published on March 26 in the Jewish Tribune, a weekly newspaper that is a subsidiary of B'nai Brith. Under Ontario's Libel and Slander Act, Galloway is required to commence his action within three months after the alleged libel has come to his knowledge. Last month, while speaking to an audience in Ottawa through a video internet connection from New York, the outspoken British MP threatened to sue the CJC's Farber and CTV for defamation over "comments [Farber] made that [CTV] allowed him to make." "I am not a terrorist. I am not a threat to Canada's national security," Galloway said during the appearance. But he did not specify how he believed he had been defamed. Galloway was scheduled to make several appearances in Canada in March and April as part of a speaking tour, but was denied entry by the Canada Border Services Agency under Section 34(1) of the Immigration and Refugee Protection Act, which bars those who provide material support for terrorist groups. His supporters in Canada called the CBSA ruling an affront to free speech that smacked of political interference by the Conservative government. At the time, Kenney refused to intervene in Galloway's case, saying said he would not give special treatment to a man who "brags about" giving financial support to Hamas and "offers sympathy for Canada's enemies in Afghanistan." The ruling came just weeks after Galloway made a highly publicized trip to the Gaza Strip to deliver humanitarian aid as the coastal territory, still reeling from Israel's three-week offensive against Hamas aimed at curbing Palestinian militant rocket attacks. 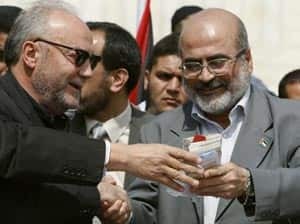 The anti-war advocate and member of the British Parliament since 1987 said he took an ambulance, wheelchairs, food and medicine to the Gaza Strip last month but is not a supporter of Hamas, which is listed as a banned terrorist organization in Canada and has called for Israel's destruction. He gave $45,000 in relief money to the elected Hamas government, but said that's what any aid group or non-governmental organization trying to help Palestinians would do.